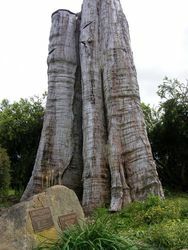 A Grey Gum Eucalyptus stump from Growler Creek, Mount Erica, was erected as a monument to sawmilling and logging pioneers of the early 20th century. Darnum was originally a timber producing town and the original timber mill's owner, Clarrie Weir, wished for the stump to be erected on the site. 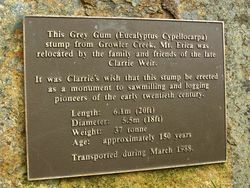 This Grey Gum (Eucalyptus Cypellocarpa) stump from Growler Creek, Mt Erica was relocated by the family and friends of the late Clarrie Weir. It was Clarrie's wish that this stump be erected as a monument to sawmilling and logging pioneers of the early twentieth century. This project was made possible by the generous support of many organisations and people. Other friends too numerous to mention.